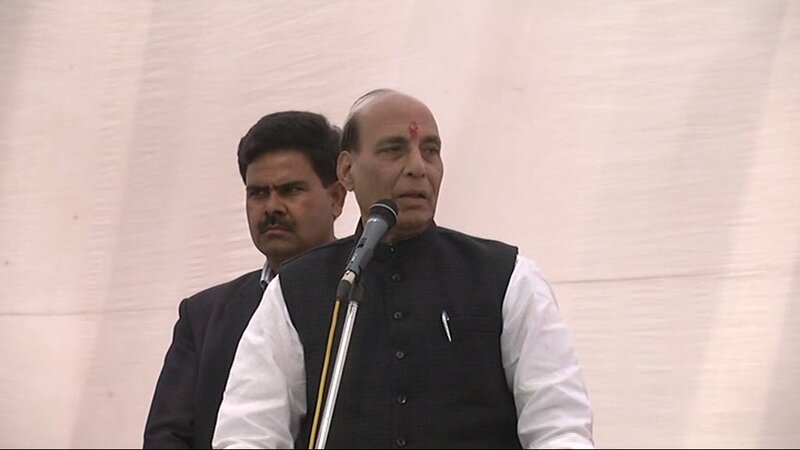 Union Home Minister and Senior BJP leader Rajnath Singh today hit out at Congress and 3 young leaders of caste based outfits Hardik Patel of PAAS, Alpesh Thakor of Thakor Sena (who has joined the party) and Dalit activist Dalit Mewani in a different style during an election rally in this central Gujarat town. ‘All of you must be knowing the three children and I want to send them a message. I am sympathetic to them because they don’t know the history of Rahul Gandhi ji with whom they are shaking hands. Rahul Ji not only drowns himself wherever he goes for campaign but also makes those sink down too who shake hands with him,’ he said. Notably Congress with a caste equation in mind has joined hands with them. Alpesh has already joined the party and was its official candidate on Radhanpur seat. Mewani was contesting as a Congress supported independent from Vadgam, Hardik who has not yet attained the age to contest election was opposing BJP all out.